The heading of the story has been slightly edited. To read the full feature, click here. The international movement La Via Campesina, which works for food sovereignty and rights of smallholder farmers around the world, has worked in Honduras since 1998. The international organisation promotes agroecology, calling for environmentally focused agricultural practices in addition to its platform of farmers’ land tenure rights and stopping violence against women. Sonia Isabel Triminio and Mirna Sagrario Duron both joined La Via Campesina a few years ago. Triminio has been a farmer her whole life. Her family’s coffee farm perches on the mountains that surround Rancho del Obispo, a village in the Corredor Seco inhabited by only a few people. She just finished building a house with adobe bricks, a few steps away from her vegetable garden, where she grows maize and beans. “Last year we lost all the beans and the previous [year], all the maize,” Triminio says. As elsewhere in the Corredor Seco, without productive fields many are forced to leave for the cities or for other countries, she says, “and that is what we don’t want”. Duron is a single mother of five and sole provider for her family. She built a wood oven on her patio where she bakes loaves of bread to sell when she needs money. She sells the bread in Tegucigalpa, a five-hour bus ride away. Duron doesn’t want to be forced to leave her home in Ojo de Agua. In spite of losing more than 60% of her last harvest of maize and beans in the past year, she is trying hard to bring new life to her lands: she uses organic compost to regenerate the soil and make it hold water better, which she learned through La Via Campesina. 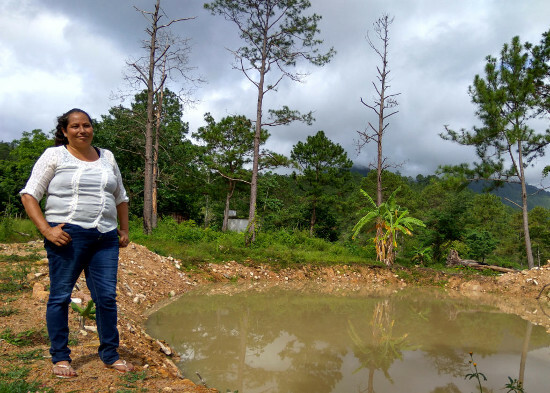 Against the backdrop of the upheaval of politics, lack of jobs and climate change, different organisations of farmers across the country continue their struggle to remain in Honduras, in their ancestral lands. From the Corredor Seco to the Atlantic Coast, cooperatives seem to be a way to try to deal with the climate changes threatening Honduras. “Creating networks is a way to strengthen the local economy in rural areas, things that make it easier to improve farmers’ incomes and lifestyles,” Potts says, for example, by bridging “the gap between the income that they get at home and the one that they get if they move”.